Inder Loves Folk Art: More School Clothes! Part 2: The Citronille Suzanne. More School Clothes! Part 2: The Citronille Suzanne. As promised, I am back to share another item I made for the start of school - in this case, for Maggie. This is the Citronille Suzanne dress (which I made in a tunic length due to fabric constraints). 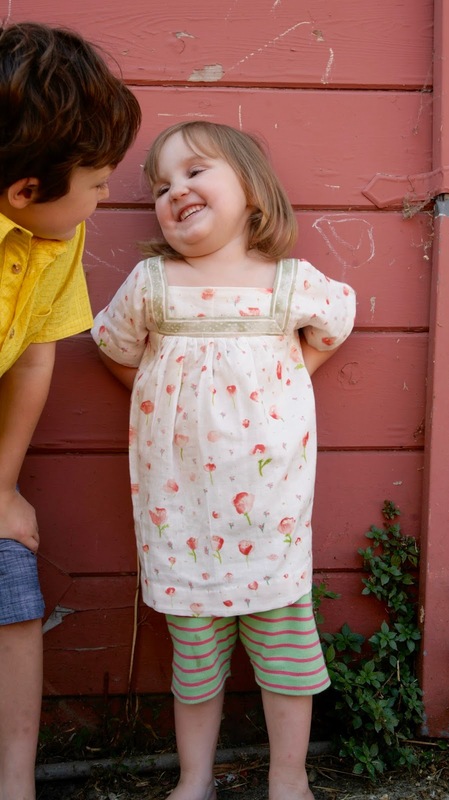 Citronille is a French pattern company with the most drool-worthy old-fashioned patterns for children. Some of the patterns are available in English versions, and you can also get additional patterns with translations included from Fiddlehead Artisan Supply. This pattern comes in an English version, but I ordered it from Fiddlehead to save myself the international shipping costs. 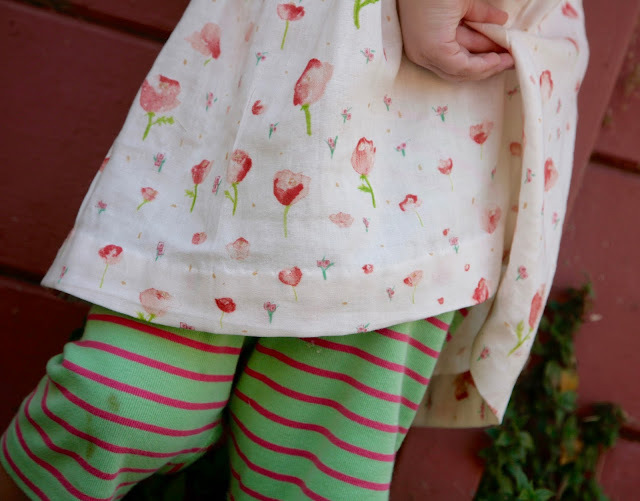 I had about one yard of this gorgeous Nani Iro "Poppy Trip" double gauze; maybe less because it shrank a bit in the wash. This lovely print runs up and down but it has a pretty green border along the selvedge. It is not a regular border print, because the border runs parallel to the print, which is a bit strange. I was able to squeeze this little tunic out of the fabric I had with only small scraps leftover. This pattern comes in sizes 2, 4, 6, and 8. I made the size two. With that wide neckline, it makes sense to go down a size when in doubt, to avoid the shoulders falling down the arms. The basic construction is part of the charm of this pattern, of course - it has a very folkwear vibe. But I could not resist complicating it significantly! I wanted the insides to look nice and finished and I decided to really step things up by using the border of the Nani Iro to embellish the neckline of the dress. I lined the yoke pieces with muslin, since the double gauze is quite sheer, and applied the trim around the neck as a reverse facing, basically, machine sewing it to the shoulders and bottom yoke, and then hand stitching it in place. This makes the inside of the dress much cleaner and more comfortable. Having hand stitched the neckline, of course I had to hand-hem the sleeves and skirt! Double gauze is so easy to hand-sew invisibly, because you can pick up only the underlayer of gauze. This pattern has no back or front! It's the same both ways! Of course double gauze gathers beautifully and hangs so nicely so it suits a simple pattern like this perfectly. Maggie recently got a haircut, at my insistence, since her long baby-fine hair was looking really scraggly along the ends. She got little bangs, and I love them! They swoop to the side and frame her sweet brown eyes. 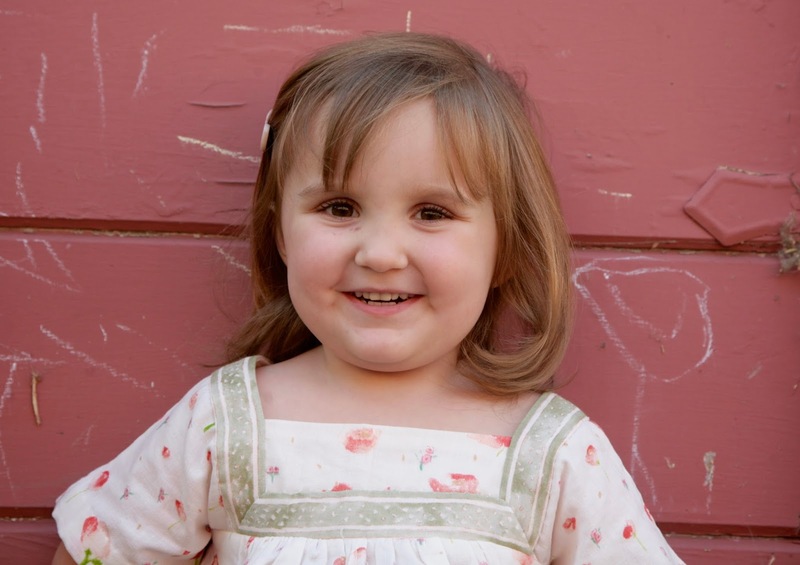 And her hair is still long enough to put in a ponytail or little braids, but looks much better down now. Yay for less maintenance! One of my friends mentioned that the overall effect is very "Lizzy Bennett" with the "muslin" fabric, the empire waist and square neckline! I can see that. And Maggie has all the intelligence and sass of a Lizzy Bennett! She may be small for her age, but I am told she stands up for herself at school! She has been well trained by her brother, apparently! Maggie paired the tunic with some too-large Hanna Andersen shorts, which - with the bare feet - makes her look like a little hobbit to me! A regency hobbit! She hasn't worn this to school yet, but she really likes it so I think she'll get a lot of wear out of it! Although double-gauze is expensive, precious stuff, I try not to restrict the clothes I make to "nice occasions." We don't have that many nice occasions, and I'd rather see clothes worn and loved. My final review of this pattern? I think it's cute, but it is so basic, I don't know how much I will use it. The lack of nice finishing bugs me a bit, and I can't imagine sewing it as instructed - I think I would always line the yoke and at least use bias tape to finish the shoulders. That said, what a perfect pattern for a brand new beginner to sewing! I am considering tracing it off for my own use (I don't need instructions for something like this!) and giving my copy away to a friend who is just learning to sew. For being so fast and simple, it really is a pretty dress! 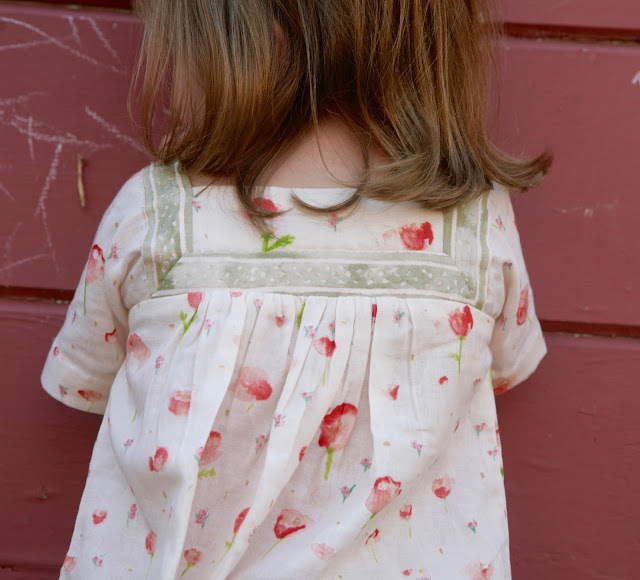 Citronille patterns are so pretty to look at, and they do sew up very nicely, but they do not have the attention to detail and thorough instructions I've come to expect from Oliver + s and other modern indie patterns. Sewing with Citronille is more like sewing with vintage patterns - basic sewing knowledge is assumed and information about nice finishing (understitching, for example) is often not included. That said, you couldn't ask for prettier designs! They really are so special and pretty. I am going to make at least one more item for Maggie for this new school year, and then I need to work on several gifts. So you'll be hearing from me again soon! Do you do back to school sewing for your kids? What a beautiful dress! It's floaty and ethereal and is actually very woodland elf to me, if we're going to go LOTR, though I totally see the Hobbit reference with the pants. I love the trim you chose. Gorgeous! 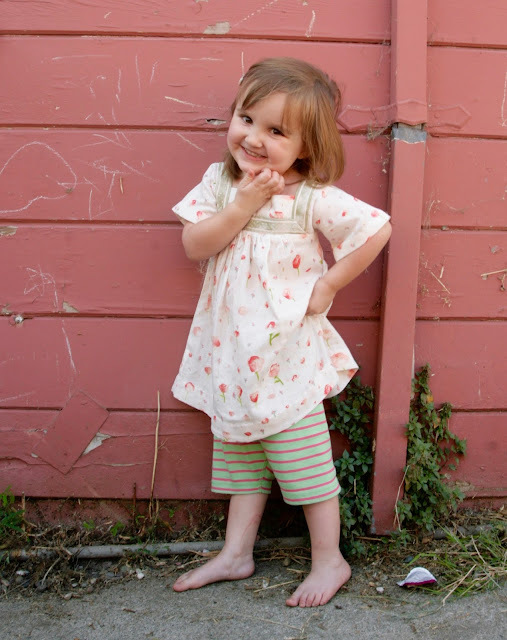 Aww... the dress is almost as adorable as little Maggie herself. I love her haircut, the fringe ('bangs' sounds so funny to me) really suits her. And despite the sweet looks I can imagine her being quite forthright and assertive. Go Maggie! I love this dress so much! Once you learn on patterns like O+S, it's hard to go back to patterns with less professional finishing. But it's so awesome when you possess the skill set to make any pattern look professional, knowing how to understitch necklines and other technical details like that. Don't you think? Beautifully done, Inder! Such a cute little dress on your cute little Maggie! I love Joe's outfit too! I cannot sew with yellow but I love how it looks on those that suit the colour! I think this is my most favourite thing you have ever made. I have several of these gorgeous patterns, very generously sent to me by Sarvi and Ana-Sofia, I really want to sew them. I kind of understand the simple style. 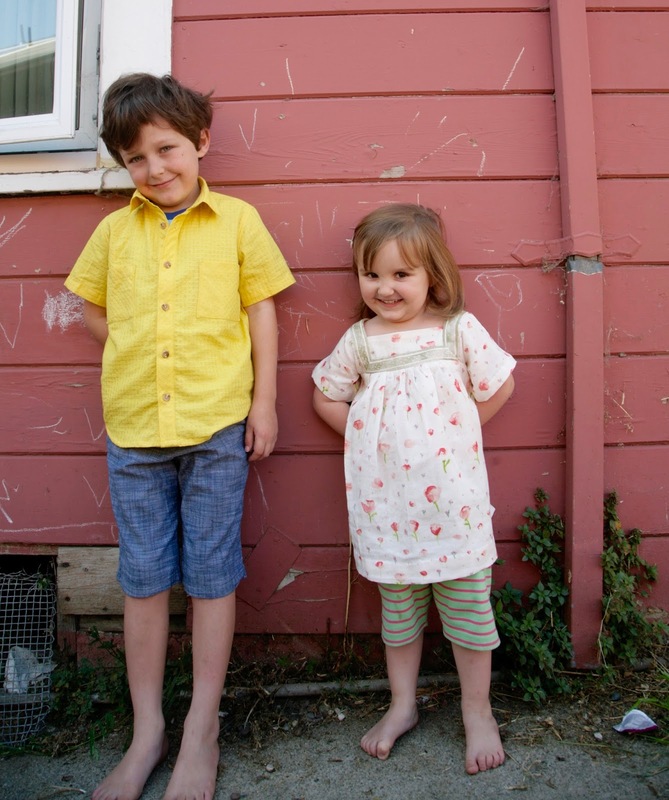 If you are sewing for only one child, why make a fussy garment? If it is not needed to hand down or you have limited time classic and quick is great. If I have made anything for my girls that you like I would love to swop with you when Maggie grows out of it. I really love this style but I know what you mean about Citronille patterns - they are rather basic. The pattern pieces are nice and easy to trace and cut out, though! Your use of the border for the neckline is brilliant - so perfect! Regency hobbit! Snort!! Hilarious. She is insanely cute in this. I'am glad to read the whole content of this topic and am very excited.Thank you. More School Clothes! Part 1: The "Golden Shirt."